Cheap vs Expensive Tablets – What’s the Difference ? The price range for Android tablets is large ranging from very cheap/inexpensive tablets (£40- £90) to the mid range (£90-£200) to the expensive £200 and above. So what are the differences between these tablets, and are these differences important to you? Remember what is important will be determined by who is going to use it, and what they are going to do with it. Looking through the tablet specs on Amazon or other sites requires a little patience as not all of the features are listed in the product details. You should look at the questions and reviews as they often contain additional information about the product. Before you look at the various tablet specifications you should acquaint yourself with what features can be supported on a tablet, and which ones are important. Knowing whether or not the tablet has a certain functionality is of little use unless you understand how it effects what you can do with the tablet. 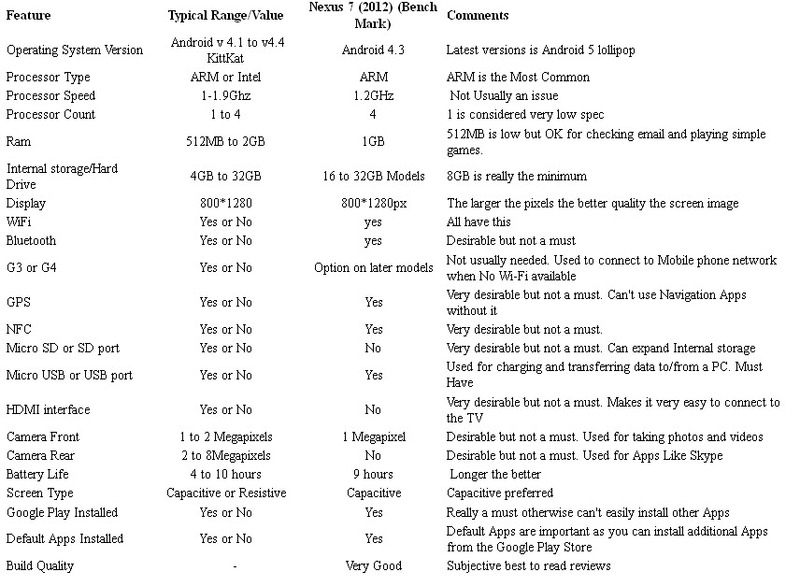 This article cover some of the most important features and why they are important and This Table shows the common Tablet features using the original Google Nexus 7 as a benchmark for comparison. I’ve chosen the Nexus 7 as the benchmark as it is widely acknowledged as a very good tablet, and it also happens to be the one I use. 1GB of RAM is considered minimum, don’t consider tablets with less. 6-8GB of internal storage should also be minimum, and external storage support (SD cards) is very desirable,especially with less than 16GB of internal storage. See Understanding Android Storage for more details. Low cost devices tend to have low quality cameras. A 5MP rear camera is considered adequate for good quality photos. Android devices come with a variety of sensors and communication options. Again low cost devices tend not to have GPS and some don’t even have bluetooth. The android sensor guide details the main sensors and what they are commonly used for. The low cost models tend to have an old version of Android installed. Today old is considered version 4.4 (KitKat). and below. This is not an obvious part the product specifications, but automatic upgrades are very important. . 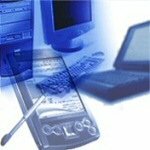 Without automatic upgrades you will need to do manual upgrades which require a high level of technical competence, and may not be possible as you may not find an upgrade package for your device. If the device you are considering doesn’t have this ability then you should consider it frozen, and you should be happy with the fact that it runs Android version x and will probably not support the next version. Having said that all tablets will eventually become frozen as the newer builds will eventually require newer hardware. 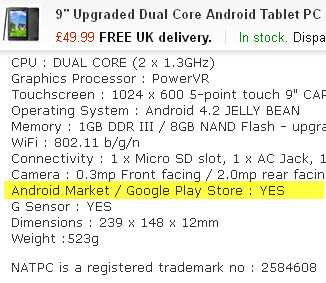 Google operate a 2 year from release update policy on their nexus range of tablets and smart phones. Generally low cost tablets will be running an older version of the Android OS. The current latest version is 6 whereas many low cost devices will be using 4.4 (KitKat). They will have less RAM, smaller hard drives, no 3G/G4 capability, no GPS or Bluetooth, and no automatic upgrade capability when compared to medium to higher priced branded tablets from Google (Nexus) and Samsung. Here are two comments I found on this forum regarding low costs tablets which cover the most important points. Important Note: Access to the Google Play store is crucial (see article below in resources). Android OS updates Might not really be so important- Interesting article on how Google can update your device via the Google Play Store.